Aizer A and J Currie (2014) “The intergenerational transmission of inequality: Maternal disadvantage and health at birth,” Science 23; 344(6186): 856–61. Brown D, A Kowalski and I Lurie (2015), “Medicaid as an investment in children: what is the long-term impact on tax receipts?” NBER. Case A and A Deaton (2015) “Rising morbidity and mortality in midlife among white non-Hispanic Americans in the 21st century,” PNAS 112(49): 15078–15083. Cohodes S, D Grossman, S Kleiner and M Lovenheim (2016), “The effect of child health insurance access on schooling: Evidence from public insurance expansions,” Journal Human Resources 51(3): 727–759. Currie J, S Decker and W Lin (2008), “Has public health insurance for older children reduced disparities in access to care and health outcomes?” Journal of Health Economics 27(6): 1407–1652. Currie J and J Gruber (1996), “Saving babies: The efficacy and cost of recent expansions of Medicaid eligibility for pregnant women,” Journal of Political Economy 104: 1263–96. Currie J and H Schwandt (2016a), “Inequality in mortality decreased among the young while increasing for older adults, 1990–2010,” Science 352(6286): 708–12. Currie J and H Schwandt (2016b), “Mortality inequality: The good news from a county-level approach,” Journal of Economic Perspectives 30(2): 29–52. 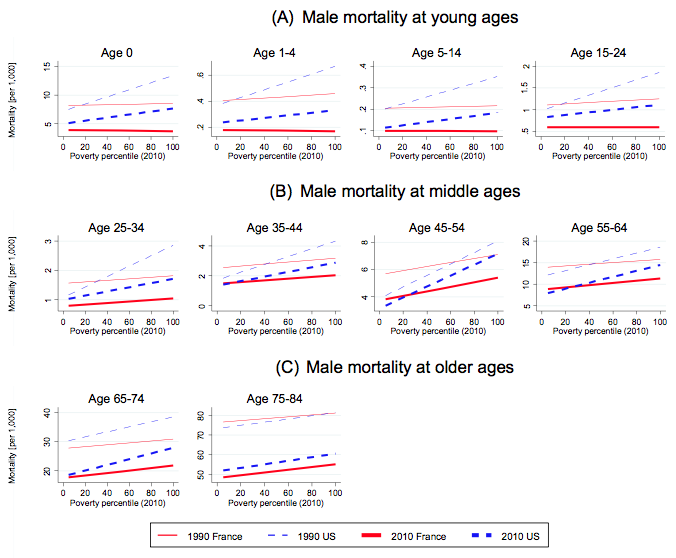 Currie, J, H Schwandt and J Thuilliez (2018), “Pauvreté, Egalité, Mortalité: Mortality (In) Equality in France and the United States,” NBER, Working paper now24623. Miller, S M and L R Wherry (2014), “The long-term health effects of early life Medicaid coverage,” Journal of Human Resources 53(2). Touraine, M (2014), “Health inequalities and France’s national health strategy,” The Lancet 383(9923): 1101–2. Wherry, L R and B D Meyer (2015), “Saving teens: Using a policy discontinuity to estimate the effects of Medicaid eligibility,” Journal of Human Resources 51(3): 556–588. Wherry L R, S Miller. R Kaestner and B D Meyer (2015), “Childhood Medicaid coverage and later life health care utilization,” Review of Economics and Statistics. Research Professor of economics, CNRS (Centre National de la Recherche Scientifique) and Panthéon-Sorbonne University.